Networking Ninja Award nominations sought. My Pinnacle Network holds 4th annual recognition of the region’s best connectors. – My Pinnacle Network and cast their vote for their favorite networkers in any of the following categories: Best Connector (helping bring people together); Most Ubiquitous (appears to be at every networking event); Most Altruistic (does most for others); and Brightest Beacon (adds energy to networking events). The deadline to vote is February 28. Winners will be announced in March, with awards being given out on March 20 at the South Shore Professional Networking Group event at the Cask & Flagon in Marshfield. “When you pass a lead or referral or connect somebody and that leads to business for that person, you create cosmic goodwill. Hopefully, that comes back in the form of new business to you. Sometimes it does, sometimes it’s not as apparent,” noted Steven V. Dubin, one of the founders of My Pinnacle Network. He continued, “We created The Networking Ninja Awards to recognize the contributions of our areas best connectors and networkers, who continually add to the well of cosmic goodwill.” For information about the Networking Ninja Awards, please visit www.MyPinnacleNetwork.com, or contact Steven V. Dubin at SDubin@MyPinnacleNetwork.com or 781-582-1061. Networking Ninja Award nominations sought. My Pinnacle Network holds 4th annual recognition of the region’s best connectors. We live in a high-tech age with texting, tweets, snap chats, etc. Yet ask any small business where they get the majority of their new business leads and referrals and it’s through good old-fashioned networking. 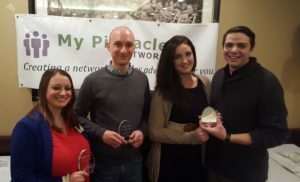 My Pinnacle Network, a business-to-business networking group with monthly meetings in Braintree, Mansfield, Marshfield, Needham, Plymouth and Westborough, MA will honor the individuals who do networking the best with its fourth annual Networking Ninja awards. During the month of February, My Pinnacle Network members and the general public can go to www.mypinnaclenetwork.com and cast their vote for their favorite networkers in any of the following categories: Best Connector (helping bring people together); Most Ubiquitous (appears to be at every networking event); Most Altruistic (does most for others); and Brightest Beacon (adds energy to networking events). The deadline to vote is February 28. Winners will be announced in March, with awards being given out on March 20 at the South Shore Professional Networking Group event at the Cask & Flagon in Marshfield.